Looking for a hearty recipe to keep you warm this season? 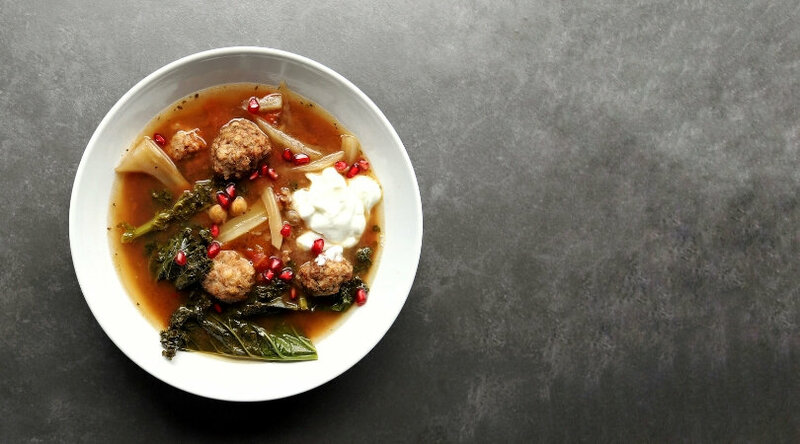 Packed with fresh flavours, this Persian-inspired low FODMAP lamb meatball stew is the perfect winter sidekick. With a rich, savoury flavour and festive pops of colour, it will keep your insides nice and toasty! With all the shoveling here in Canada, I’m always on the lookout for dinners that will make themselves! After a long day of moving snow from one end of my driveway to the other, it’s extra nice to plop down to a ready-made meal. This lamb meatball stew is the perfect winter companion. 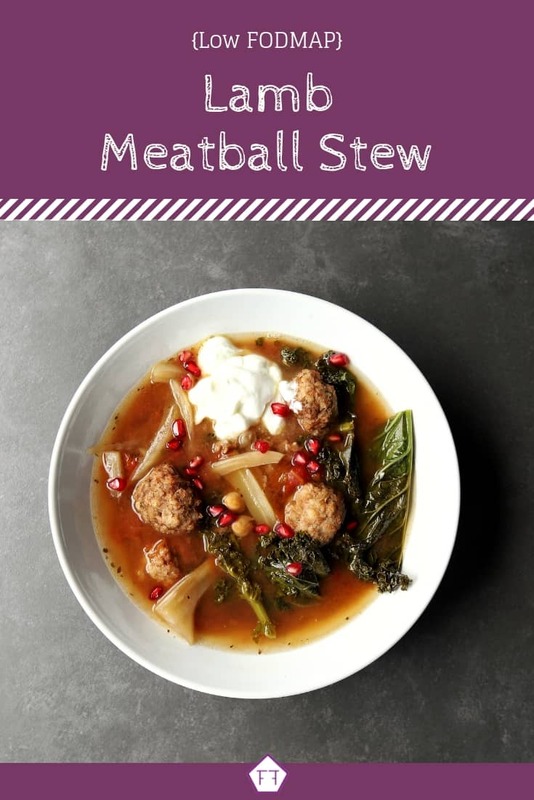 Cooked in a savoury broth and packed with meatballs, it will be a family favourite in no time! 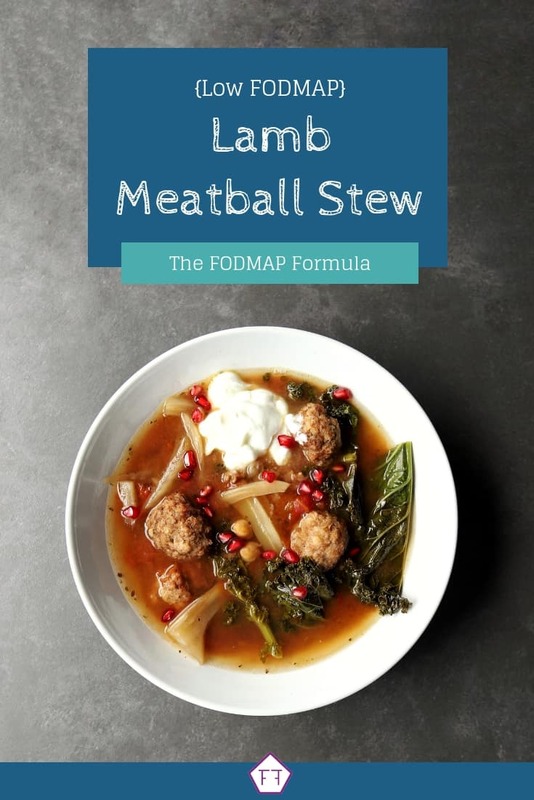 Think this low FODMAP lamb meatball stew sounds great, but you don’t have time to try it now? Don’t worry, you can PIN THIS POST for later! Looking for a savoury dinner idea to keep you warm this season? This lamb meatball stew will hit the spot! 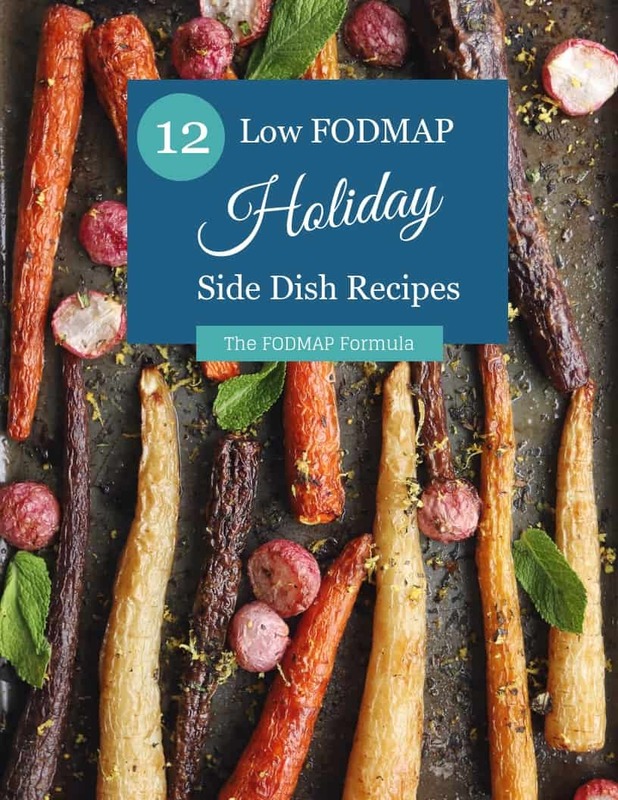 Check out the notes below for tips on keeping this recipe FODMAP-friendly. First, if you’re in the elimination phase of the Low FODMAP Diet, you’ll need to use gluten-free breadcrumbs. Remember, using a gluten-free product doesn’t mean you’re home free. Check for other high FODMAP ingredients like inulin, amaranth flour, honey, apple or pear juice, or puree. For my Canadian peeps, I use President’s Choice gluten-free breadcrumbs. If you can’t find low FODMAP breadcrumbs in your area, you can also toast 2 pieces of low FODMAP bread and send them through your coffee grinder. Just remember to stick them in the fridge for about 10 minutes so the condensation doesn’t make your crumbs gooey. Next up is lamb. Since lamb is a protein, it doesn’t contain any FODMAPs. That means you can eat as much lamb as you’d like without adding to your FODMAP load. We’ll also be using beef broth as the base for our stew. I haven’t found a low FODMAP beef broth option at my local store, yet. So I normally make my own. If you need a low FODMAP beef broth recipe, you can try this one from Fun Without FODMAPs. This recipe also uses chickpeas. According to the Monash app, canned chickpeas are low FODMAP in servings of 1/4 cup per sitting. Servings of 1/2 a cup or more are high in galactooligosaccharides (GOS). A standard can of chickpeas is about 2 cups. This means our recipe will have 1/4 cup of chickpeas per serving. This is within Monash’s recommended range. This recipe also uses common tomatoes. According to the Monash app, common tomatoes don’t have any detectable FODMAPs. This means you can eat as many tomatoes as you want without adding to your FODMAP load. 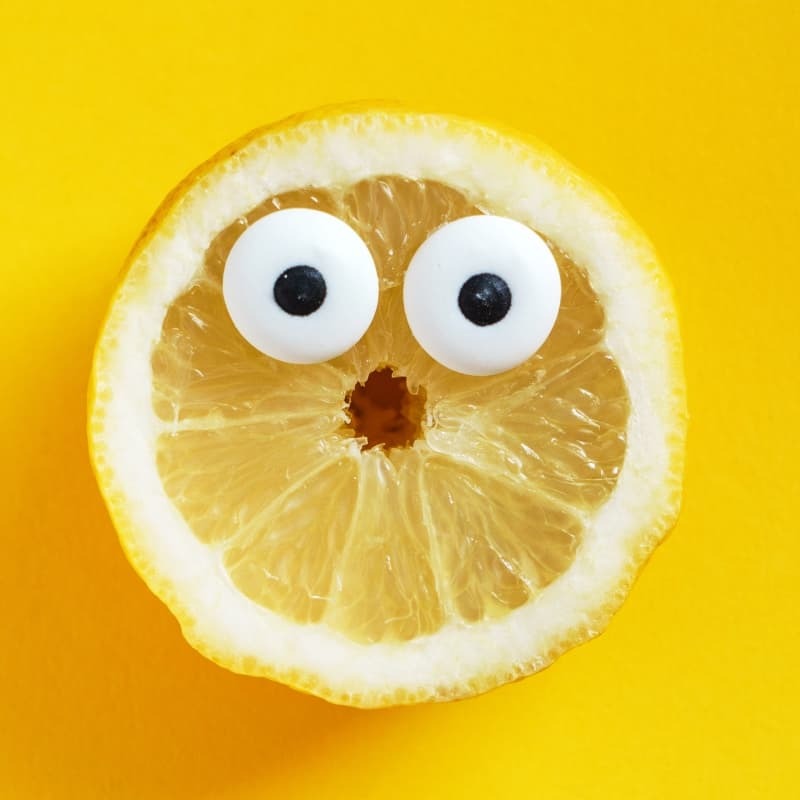 Remember to keep the juice! We’ll also be using fennel. According to the Monash app, fennel is safe in servings of 1/5 of a bulb per sitting. Servings of half a cup or more are high in both fructan and mannitol. Our recipe uses one bulb for 8 servings. This works out to 1/8 of a bulb per serving. This is well within Monash’s recommended range. This recipe is traditionally made with pomegranate juice. But, since Monash hasn’t tested pomegranate juice, yet, we’ll swap it for cranberry juice. According to Monash, cranberry juice is safe in servings of 1 cup per sitting. They don’t list a maximum serving size. Our recipe uses 1 cup of cranberry juice total. This works out to 2 tbsp of cranberry juice per sitting which is well within Monash’s recommended range. Next up is kale. According to the Monash app, kale only has trace amounts of FODMAPs. This means you can eat as much kale as you want without adding any significant FODMAPs to your FODMAP load. We’ll also be adding a dollop of Greek yogurt. If you’re in the elimination phase of the Low FODMAP Diet. You’ll need to use lactose-free yogurt. For my Canadian peeps, I’m head over heels in love with President’s Choice lactose-free Skyr yogurt. Last but not least, we’ll be using pomegranate seeds (arils). According to the Monash app, pomegranate seeds are low FODMAP in servings of 1/4 cup (45 g). Servings of 1/3 cup or more are high in fructans, so measure carefully. This recipe uses 1/4 cup of pomegranate seeds total. This works out to 1/2 a tbsp of seeds per person. This is well within Monash’s recommended range. This recipe has a ton of ingredients. Worried they’ll all add up and push you over your limit? Don’t panic. This is a problem known as FODMAP stacking and I promise I did my FODMAP math! Check out my article explaining FODMAP Stacking for more information. 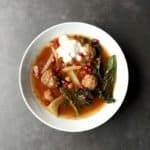 Want to try this low FODMAP lamb meatball stew? Don’t forget to PIN THIS RECIPE for later! Looking for a savoury dinner idea? This hearty lamb meatball stew will keep your taste buds and your tummy happy! Combine all your meatball ingredients in a large bowl. Mix the ingredients with your hands until the meat is evenly seasoned, then shape the mixture into 1" meatballs. Heat up half your oil in a large frying pan and add half your meatballs. Brown them for 8-10 minutes (they may still be a little pink on the inside), then add them to your slow cooker. Repeat with the second batch. Add the beef broth, chickpeas, diced tomatoes with juice, fennel, cranberry juice, cumin, and coriander and stir. Cover and cook your stew for 7-8 hours on low. Once your stew is cooked, turn off your slow cooker and add the kale. Let the stew stand for 20 more minutes, then serve with a dollop of Greek yogurt and a sprinkle of pomegranate arils. This easy low FODMAP lamb meatball stew will keep you warm all winter long! If you like this recipe, don’t forget to share it! Together we’ll get the Low FODMAP Diet down to a science! Low FODMAP Marinara Sauce Your whole family will love this quick and easy dinner idea. Made with simple ingredients, this will be one of your go-to recipes in no time. Low FODMAP Baked Ziti Curb your comfort food cravings with this delicious baked ziti! Packed with rich, savoury flavour it will be a family favourite in no time! Hi, I don’t see the ground lamb listed in the recipe. Does it call for 1 pound? Thank you! Yes, it is 1 lb. Sorry about that! I’ve corrected the recipe.